← How to convert documents of Microsoft Office Excel to JPEG? There are at least two kinds of PDF passwords: owner passwords and open passwords. Setting PDF owner passwords prevents PDF files from being printed, edited, changed, or copied by anyone without a user password. Setting open PDF passwords permits those who have PDF open passwords to read PDF files. When you convert HTML to PDF and set PDF password, you should try VeryPDF HTML Converter, which was designed to convert HTML to PDF. This application provides two versions: the GUI (graphic user interface) version and the CLI (command line interface) version. Both are available at the product webpage of VeryPDF HTML Converter. VeryPDF HTML Converter Command Line, the CLI version, can help you convert HTML to PDF and set PDF password in an extremely quicke way, especially when convert files in batch. This article will take open password as an example to show you how to convert HTML to PDF and set PDF password via command line. 1. Download VeryPDF HTML Converter Command Line. Click VeryPDF HTML Converter Command Line to download this application and install it on your computer. Running command line is often the quickest way to launch programs or to open folders and files. 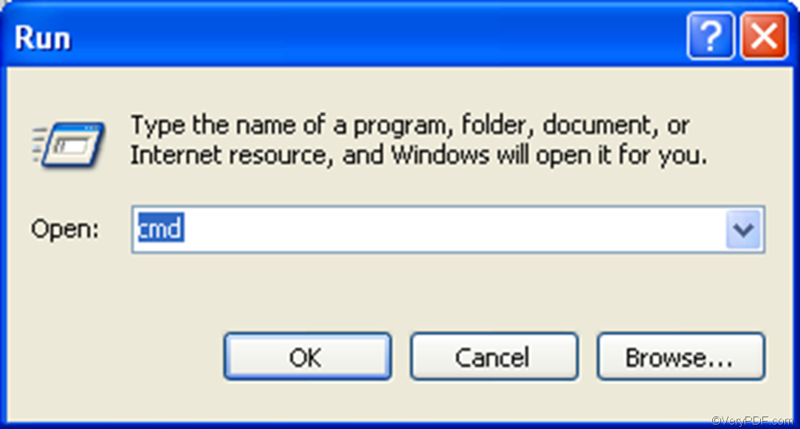 When you click Start in Windows XP, you will see the Start menu as the illustration below. Then, you should click Run. The Run dialog box will pop out, and please type “cmd” and press OK in the Run dialog box. d:\htmltools\htmltools.exe is the directory of the main executable file named htmltools. –keylen 2 is the option that sets key length to be 128 bit RC4 encryption (Acrobat 6 or higher). If the number following –keylen is 1, the key length should be 128 bit RC4 encryption (Acrobat 5 or higher).If the number is 0, the key length would be 40 bit RC4 encryption (Acrobat 3 or higher). c:\in.html is the path of the input file. d:\out.pdf is the path of the output file. If you want to convert files in batch, you can use the wildcard *. For instance, if you use c:\*.html to replace c:\in.html in the command line, all the HTML files on disk C will be input files. Of course, you should also set the output file directory as d:\*.pdf. After type a proper command line, please press Enter on the keyboard. After the conversion is done, when you open the result PDF file, a dialog box will pop out, requiring you to type the open password. To buy VeryPDF HTML Converter Command Line, please click Purchase. How to make a thumbnail for mht document? How to convert mht to textual file? How to rotate the page while converting url to picture? This entry was posted in HTML Converter (htmltools) and tagged command line, HTML to PDF, set PDF password. Bookmark the permalink.